The issue of ocean plastic has been in the news a lot recently. We’re only just beginning to understand the extent of the problem - much of which is caused by today’s throwaway society - and its repercussions on our environment, wildlife, eco systems, and human health. Global plastic production is increasing at an alarming rate to meet demand for quick, convenient, disposable packaging and serve-ware. In the last 10 years we manufactured more plastic than in the whole of the last century, and today half of all plastic produced is for single-use purposes. There is a huge mismatch between the life-span and use-span of plastic. A single-use plastic bag is used on average for 11 minutes, yet it’s estimated to take over 450 years to break down. Due to our imperfect waste management systems and littering, unfortunately much of our plastic waste escapes into the natural environment. If you spend time on any of our beautiful South Hams beaches, you will have seen for yourself how much plastic washes up with every tide. Progress is being made in some areas. The 5p plastic bag charge that was introduced in 2015 has succeeded in cutting plastic bag use by 85% nationwide, which has also reduced the number of plastic bags spotted on UK beaches. However, the charge doesn’t apply to smaller independent stores (of which we are lucky to have many in Kingsbridge), and a survey taken last summer highlighted that Fore Street shops were still handing out 2,700 plastic bags in an average week. A group of Kingsbridge residents have decided to tackle the town’s plastic bag usage by launching a new borrow-a-bag scheme. They recognised that as customers we all have times when we forget to bring our own bag, or when we make spontaneous purchases and don’t have a reusable bag with us. Sometimes we can manage with no bag at all, but if it’s raining, or we’re buying multiple items, it can be difficult to refuse a single-use plastic bag. To address this, they are launching a new Borrow-a-Bag scheme, with the support of the Town Council and the Kingsbridge TIC. How does the Borrow-a-Bag scheme work? Participating stores will have a stock of cloth reusable bags available to offer customers when they haven’t got a reusable bag. 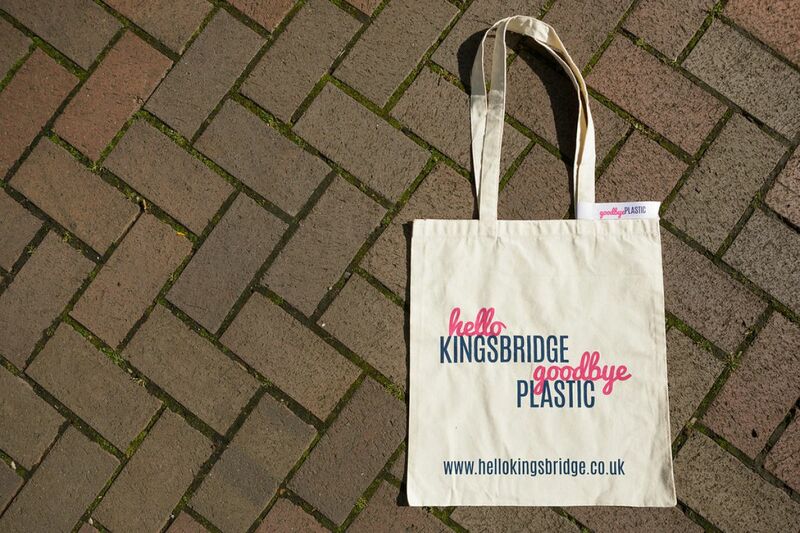 The bags are easily identified by a ribbon with ‘Hello Kingsbridge, Goodbye Plastic’ stitched onto their straps. Customers are free to borrow the bag to take their goods home, and then return it to either the TIC in the town square, or another participating shop when they next come into town. There is no charge for borrowing the bags, the scheme works on trust and the belief that the majority of people would like to see it work, as a step towards helping there be less plastic in the ocean. The organisers will be attending the Kingsbridge Farmers Market on Saturday 7th October to raise awareness of the scheme and answer any questions. If you are a store that would like to have borrow bags available for your customers, please get in touch with Sam at the TIC either in person or via the Kingsbridge Traders Facebook page. Once this scheme is up and running, the team have plans to launch more initiatives to reduce single-use plastic in Kingsbridge. If you’d like to get involved, please contact [email protected] or pop into the TIC to express an interest.